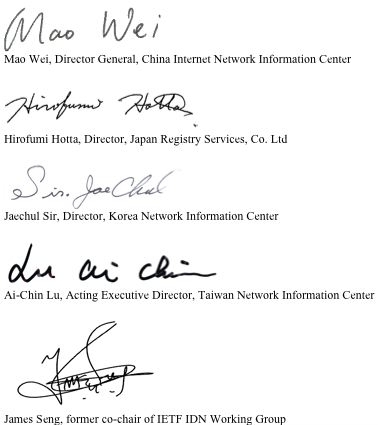 We, members of the JET (Joint Engineering Team), send this open letter to request Microsoft Corporation to implement IDN (Internationalized Domain Names) standards in the next version of Internet Explorer. IDN is a critical enabling technology that will make the Internet more useable and attractive to the majority of the Chinese, Japanese and Korean population who do not use English in their daily life. In fact, IDN is mentioned as one of the Declaration of Action of the World Summit of Information Society (WSIS). Most of the web browsers, such as Safari, Firefox and Opera have implemented IDN standards. This means that users can use IDN in these web browsers without additional applications or plug-ins. The lack of IDN implementation in Internet Explorer is a serious deterrence to global Internet users, especially for those who do need IDN. Many website owners and application developers are also eagerly waiting for Internet Explorer to adopt IDN standards. This will, in turn, benefit Microsoft, by increasing Internet users and more intense use of the Internet, opening up more sales opportunity of personal use of PC, e-commerce platforms, related software products and so on. 1 IDN standards refers specifically to RFC 3490, RFC 3491, RFC 3492 and RFC 3454. 2 JP domain names are now managed by JPRS. Local Time: Friday, April 19, 2019 01:35 PM PDT – Page Load: 0.3617 Sec.